Don't see too many of these around anymore. 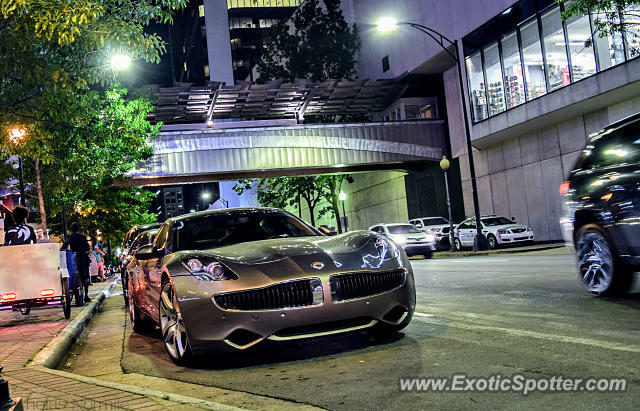 Fisker Karma in front of the EpiCentre in uptown last weekend. Indeed. And the ladies love it. The only car with a proper mustache. Haha, I’m in Hollywood, maybe that’s the reason, I’ll post 1 of them tonight, only got a picture of one of them. I like the new car they’re coming out with. Looking forward to it. No fair Aidan! This is only like the fifth or sixth Karma I've ever even seen. And thanks for the heads up Patrick; I'm in Raleigh now, but when I'm back in Charlotte next week I'll definitely see if it's still there. I did actually see a Vantage tonight in Raleigh. Man I haven't seen one of these in years. Also a tip off for you and anyone in Charlotte, there has been a black V8 Vantage GT parked off of South Blvd for the past few days, right across the street from Lowes. I just saw 3 today, haha.